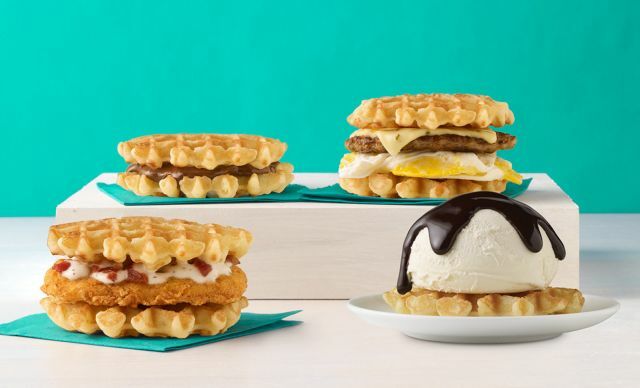 White Castle expands their slate of Belgian waffles by introducing three new waffle dishes, including a waffle sundae, and bringing back the Chicken & Waffle Slider. The Chicken & Waffle Slider features either a grilled or crispy chicken patty served with gravy and bacon crumbles between two small Belgian waffles. - Waffles with Nutella consists of Nutella hazelnut spread between two Belgian waffles. - The Belgian Waffle Sundae takes a Belgian waffle and tops it off with a scoop of vanilla ice cream and some Ghirardelli chocolate sauce. - The Spicy Waffle Breakfast Sandwich features a choice of either hickory-smoked bacon or sausage, a slice of jalapeno cheese, and a fresh-cracked egg served between two Belgian waffles. It's essentially the regular menu Waffle Breakfast Sandwich with jalapeno cheese instead of American cheese. 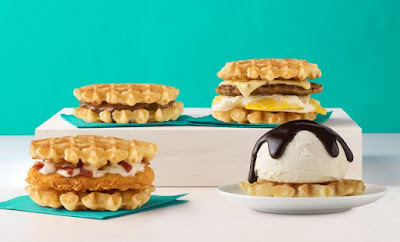 The waffle items are available for a limited time and White Castle is offering a deal where you can mix and match any two of them for $4.